Black Friday is HERE! Who’s EXCITED to Shop til you drop?! It’s one of busiest shopping weekends and there are so many good SALES going on IN-STORE and ONLINE. So to kick off Back Friday, I’ve rounded up some of the best Sales happening at your favorite stores. Everything is linked below so you can easily shop and cross off your Christmas list. Target- SO MANY GOOD DEALS on Electronics, Toys, Kitchen & Home, Clothing etc. Black Friday Doorbusters extended all day SATURDAY. Hello, November! We are post Halloween festivities which means we are on countdown till Thanksgiving. Anyone else excited for the Holidays?! The leaves are in peak foliage all around the city, which means there is still plenty of Fall to enjoy in New York. And like other seasons, there is no shortage of things to do. Here’s a round up of places to go, things to see and events happening around the city. Fall wouldn’t be complete without a walk through Central Park to peep the leaves. There are so many areas to see the leaves change during peak season. A few of my favorite spots are 86th & Central Park West, 72nd & Central Park West near Strawberry Fields, The Bow Bridge and of course the iconic Bethesda Fountain & Terrace and The Mall. And if you don’t feel like walking, you can rent Citi bikes or even take a carriage ride through the park. Here is a map of NYC Fall Foliage. From November 2nd-11th, several events take place all over the city bringing you classes, cider tastings and more in celebration of New York’s orchard based cider. You can click here to find events near you. Cheers! Located in the Arlo SoHo hotel’s courtyard. A pop-up complete with apple picking, pumpkins and photo ops galore. Stop by for an Instagram worthy photo or sip Fall inspired cocktails every Thursday at their “Happle Hour” from 4pm-7pm. November 22, 2018, the 92nd annual parade will start at Central Park West and West 77th Street and head down Central Park West and travel east along Central Park South to Sixth Avenue. From there the procession will travel south on Sixth Avenue from West 59th Street to West 34th Street, ending in front of the Macy's in Herald Square. And if you would rather avoid the crowds the day of Thanksgiving, you can opt to see the floats being inflated the night before. Located at the Natural History Museum on the Upper West Side. Public access is at the entrance on West 79th Street and Columbus Avenue. Both events are FREE and open to the public. The West Village is known for it’s charming streets. And it’s no exception during the Fall months. You can usually spot several Fall inspired decorated stoops while walking around the neighborhood. There is also a hidden gem known as the The Grove Courtyard, which is unfortunately not open to the pubic. However, you can see the well landscaped courtyard through the iron gates just on the other side. The tree lined streets of the West Village with it’s picturesque brownstones makes for the perfect area to take an afternoon stroll on a crisp Fall day. What are your favorite things to do in the city during Fall months? October 10th, 2014 at 3AM was the start of a new chapter for me as I became a resident of New York City. Living here the past 4 years has brought me so much happiness, forced me out of my comfort zone and has given me experiences to last a lifetime. It still feels surreal to call this city home. And it has been one of the best decisions I’ve made in my adult life. My love for New York City has only grown with each year of being here. So, in honor of celebrating 4 years in New York City, I’m sharing a round up of all my favorite places in the city. Whether you live here, visit often or are planning to travel to New York for the first time, there is something for everyone! I hope you will enjoy these places as much I do. You can take a look back at YEAR 1 and YEAR 2 here. Bryant Park is an oasis to New Yorkers placed smack dab in the middle of one of the busiest intersections of the city. It's a great place to eat lunch, work remotely or grab coffee with a friend. And Bryant Park hosts a ton of FREE events in the park throughout the year including yoga, movies in the park, Broadway shows and a Winter village during the holidays. Jacob’s Pickles located on the Upper West Side, known for it's comfort food and craft cocktails. With it's cool industrial vibe and their killer playlist of r&b and throwback jams, it's a great bar to grab drinks after work or on the weekend. And also makes for a great first date spot. It’s also one of my favorite places to bring friends when they visit. It reminds me of home with it’s southern comfort food and ambience. Brunch is pretty much a requirement of living in the city. And with so many restaurants around, it's hard to narrow down to just ONE. So here are a few of my go-to brunch spots. Maison Pickle-The sister restaurant to Jacob's Pickles serves up the best French toast amongst other brunch favorites. Located on the Upper West Side. Foragers Tabe- This farm to table restaurant serves up a rotating menu per season. My go-to is their smoked salmon tartine. Also, make sure to check out the market attached to the restaurant. Located in Chelsea. Clinton Street Bakery- This brunch spot always has a line out the door and for good reason. They are known for their pancakes, which are AMAZING! Make sure to go early especially on the weekends and bring cash, as they do not take credit cards. Located in the East Village. Bluestone Lane is an Australian-style coffee shop & cafe. Outside of my usual Starbucks runs, this is my go-to coffee place. They have a wide range menu of both hot & iced coffee options. And there are several locations throughout the city. Book Culture is a quaint neighborhood bookstore located on the Upper West Side. Along with books, they also have an assortment of stationary and unique gifts. I always love to stop by here when I'm in the neighborhood. Central Park has so many scenic views and iconic spots. My favorite is the Gapstow Bridge near 62nd street. This picturesque spot includes views of The Plaza Hotel and surrounding buildings that align 5th Ave. It's always one of the first spots I walk through as the seasons change. Upper Westside is where you can find me on most days running errands or grabbing groceries. I love that Central Park is nearby and there are so many shops and restaurants in the area. And it’s home to some of the city’s most popular places i.e. ; Natural History Museum, The Bow Bridge in Central Park, Tavern on the Green and so many more. West Village is also a favorite of mine. With it’s charming streets, unique shops, hidden gems and iconic streets. It never gets old exploring this popular neighborhood in the city. Grimaldi's in Brooklyn is a must. Italian style pizza in an authentic environment. Usually there’s a line out the door to get inside, but it’s definitely worth the wait. And the Brooklyn Bridge is within walking distance. Artichoke Pizza in Chelsea is a great local pizza spot. Very casual dining. And their Margherita pizza is delicious. Two Boots Pizza or Bleeker Street Pizza for those late nights out when you just want a slice before the cab ride home. Dumbo, Brooklyn is my favorite place to explore and bring friends when they visit from out of town. Although it’s known for being an iconic spot, it never feels too touristy. This part of Brooklyn is still up and coming and has so many local shops, restaurants and some of the best waterfront views of the city. A few places to stop at: Jane’s Carousel, Brooklyn Roasting Coffee Shop, Grimaldi’s Pizza, Atrium Dumbo (for oysters & cocktails) and Cecconi’s for dinner. I would love to hear about your favorite places, restaurants and things to do in the city! Tell me in the comments below. Summer is underway and with July half way over, I'm reminded of all the things I still have left to do on my Summer bucket list. One of the things I love about living in a big city like New York, is that there is always so much to do. And whether you live here or planning to visit this Summer, there is something for everyone. Here's a list of events that are NOT to be missed. Concerts happening all over the city and in each borough. August dates are NOW on SALE, but hurry this weekly event sells out quickly! Bryant Park hosts free yoga in the park every Tuesday morning at 10am & Thursday evenings at 6pm. RSVP by clicking the link above. This interactive and educational pop-up will be available July- October. Get tickets by clicking the link above. This is basically a day party aboard a boat that cruises around Manhattan. Brunch served with unlimited mimosas and Bloody Mary bar. Grab your friends & book a date! Newly re-opened Pier 17 has everything from outdoor concerts, a food market hall and a pop-up bar with waterfront views. An outdoor block party, free from vehicles that takes place the first three Saturday's in August. Feel free to share this list with friends visiting NYC this Summer or save it to your phone as a reminder of things to do around city. Happy Monday, y'all! Summer is underway and July 4th is ONLY days away. Which means, it's time to start planning that BBQ with friends, pool party or lake house getaway with the family. So, in celebration of Summer gatherings, I'm sharing some essentials for entertaining outdoors. This will keep your favorite bottle of wine, champs or sparkling water at the perfect temperature for hours. No more having to chill bottles in the freezer before the party starts. No broken glass by the pool with these silicone wine glasses. Also, these make the perfect cups to take to the beach, park and bbq's. And they come in an array of bright colors, so you'll never have to guess which drink is yours at the party. No party is complete without a game. Think of this as an upgraded version of beer bong, because you're an adult now and kinda classy. The perfect addition to all your Rosé filled soirée's this Summer. This will keep all of your beverages sitting pretty while on ice. And your guests will appreciate not having to dig through an old school cooler in order to find a drink. This serving set is not only pretty but functional. It comes complete with a lid to cover your snacks, so that they can stay fresh longer. The ultimate pool party essential. Your guest can float and drink in style, with this fun pack of inflatable drink holders that includes palm trees, pineapples and flamingos. OH MY! Don't want to play bartender at your own party?! No problem. Fill this 2 gallon dispenser with your favorite alcoholic or non-alcoholic beverage and let guest pour their own drinks. It even has a seperate compartment for ice to keep the liquids from diluting. This is an easy and cost effective way to add some lighting to your outdoor space. These lanterns are made for outdoors and also come with a battery operated LED flameless candle so you can turn them on and they will last throughout your party. Shop this post by clicking on the photos below. Summer seems to always come and go so quickly. So this year, I'm making more of an effort to live each day to the fullest. And I figured I would hold my self accountable by making a list of things to do throughout the next few months. Some of which are personal things I want to accomplish and others are just things to simply ENJOY. 2. See a Movie on the lawn at Bryant Park. This is something I've wanted to do since I moved to New York and I'm excited to finally make it happen this Summer. 3. Go to a farmers market and cook dinner with all the fresh ingredients found. 4. Rent a kayak. There's actually several places in the city that offer FREE rentals. 5. Attend a few concerts. I love going to smaller local venues in the city. So far, I have tickets to see JoJo. This will my second time seeing her LIVE in concert and she does not disappoint. 6. Visit a NEW rooftop & sip a fancy cocktail. There are so many good ones in the city. 7. Go to a baseball game. Now the question is: METS or YANKEES?! 8. Watch more sunsets than Netflix. 9. Find a workout that I actually like and do it often. One place I've been wanting to try is Y7 Yoga studios. They offer Hip Hop Yoga classes which is totally my kinda workout. 10. Walk the Brooklyn Bridge and watch the sunrise. 11. Go on a Tiki Bar Crawl, including this one that recently opened in Midtown. 12. Spend more days with a Make Up FREE face. 13. Spend an afternoon at Smorgasburg, an outdoor food market full of popular NYC eats. And definitely INSTAGRAM worthy. 14. Pack a picnic and hit the BEACH for a day. 15. Visit the Museum of Ice Cream Pop-Up in Soho. And rumor has it, there is a pool of rainbow sprinkles. 16. Read 3 books. Currently reading & LOVING Single State of Mind by Andi Dorfman. 18. Host an end of SUMMER gathering with friends. I would love to hear what's on your bucket list this Summer?! Comment below. I've said this before and I'll say it again, your THIRTIES will be some of the best years of your life. They will also be the years that you really start to get to know who YOU are as an individual. And with that being said, there will be many lessons learned along the way. Two years ago at the age of 33, I wrote all about some of those life lessons and you can read it here. Now that I'm 35, I feel like there is even more that I've learned about life and myself. So, I thought I would share some of that knowledge with y'all in a Part 2 of this very topic. 1. Friends are everything. Make time for them even when you feel like you don't have the time to give. 2. Live somewhere that you miss every time you leave. 3. Make plans, but be open to breaking them every once in awhile. 4. You can have it all and still feel lonely. 5. Find something that makes you genuinely happy. And do it often. 6. People will disappoint you at some point in your life. But don't let it ruin the relationship. We're all human. 7. Change is inevitable. But it's how you react to it that will make the difference in the end. 8. Speak Up. Don't be afraid to express yourself and have honest conversations. 9. Surround yourself with strong & supportive women. 10. Eat healthier and make time for working out. Metabolism is a thing of the past. 11. You will remember experiences above anything else in life. 12. Not everyone is meant to play a role in your life. And that’s okay. 13. Do more things that are out of your comfort zone. 14. Reconnect with an old friend. Sometimes we get it right the second time around. 15. Don't let people who don't see your vision detour you from your goals. 16. The relationship you have with yourself will either be beneficial or detrimental to the relationships you have with others. 17. Get in the habit of practicing Self Care. 18. There is no statue of limitations on starting over. 19. Confidence within yourself will be your best weapon when it comes to career, dating and life in general. 20. Your THIRTIES will be the years that you will reinvent yourself over and over again. Be open to the journey. What is the best life lesson you've learned in your thirties?! Comment below. Now that Memorial Day has come and gone, it's the unofficial start to Summer. And that means it's time to soak up some SUN and take advantage of these long Summer days. Although New York City is known for being a concrete jungle, the city has a lot to offer when it comes to life outdoors. So, I'm sharing five things to do outdoors this Summer in NYC. There are an array of parks all over Manhattan, but this one is worth braving the crowds for. Bryant Park hosts a ton of events during the Summer months. You can take a FREE Yoga class in the park, watch a movie on the lawn, preview a Broadway Show & even attend an all you can eat ice cream festival. This is the perfect place to gather with friends and enjoy all that Summer has to offer. This outdoor market is located on the Upper Westside and is OPEN every Sunday from 10am-5:30pm. Being NYC's largest curated flea market with 100+ vendors, you can expect to find everything from clothing, jewelry, antiques to local food vendors. It’s a great way to spend a Sunday afternoon and support local artists. Summer wouldn't be complete without a visit to a rooftop bar. Whether you're going for the breathtaking skyline views, the Instagramable cocktails or just to cool off from the heat, there is something for everyone. Click here for a list of some of the best rooftops in the city. Cheers to Summer! This is one of the best kept secrets (in my opinion) on the Upper Westside. In a somewhat hidden location, Boat Basin Cafe sits right on the edge of Riverside Park overlooking the Hudson River. It's laid back atmosphere is accompanied by casual dining, frozen drinks, beer on tap and waterfront views. This is one of my favorite places to bring my Georgia friends when they come to visit, because they never expect to see a place like this in the middle of the city. One thing you may not know about me, is how much I LOVE to shop! But what I enjoy even more, is shopping for items at discounted prices without sacrificing quality. I love a good deal. And I almost never pay full price. That's why Marshalls is one of my go-to retail stores. So today, I’m sharing five items that I always purchase from Marshalls. A few of these may even surprise you. Buying quality skincare products doesn't have to always mean spending a ton of money. Major beauty stores often sell face masks for up to $5 per individual mask. Marshalls has a huge selection of facial masks often in quantities of 5 per box for only $4.99. I buy all my face masks from Marshalls and have discovered several new brands that I otherwise wouldn't have known about. Many of them being Korean beauty brands like the very popular The Creme Shop. I used to be a Victoria's Secret kinda gal, but it got to be way too expensive. I recently started shopping for all my bra's at Marshalls. They have so many name brands like Calvin Klein, Jessica Simpson, Maidenform, Vince Camuto and more. All of which are at huge discounted prices. I only wish I would have started shopping here for these pieces sooner. I have saved so much money and still get to buy the quality brands that I love. This is one of my best kept secrets (well not anymore). I buy a majority of my makeup brushes from Marshalls. And I've been really impressed with the array of different brands they offer. Especially when it comes to beauty blender dupes. 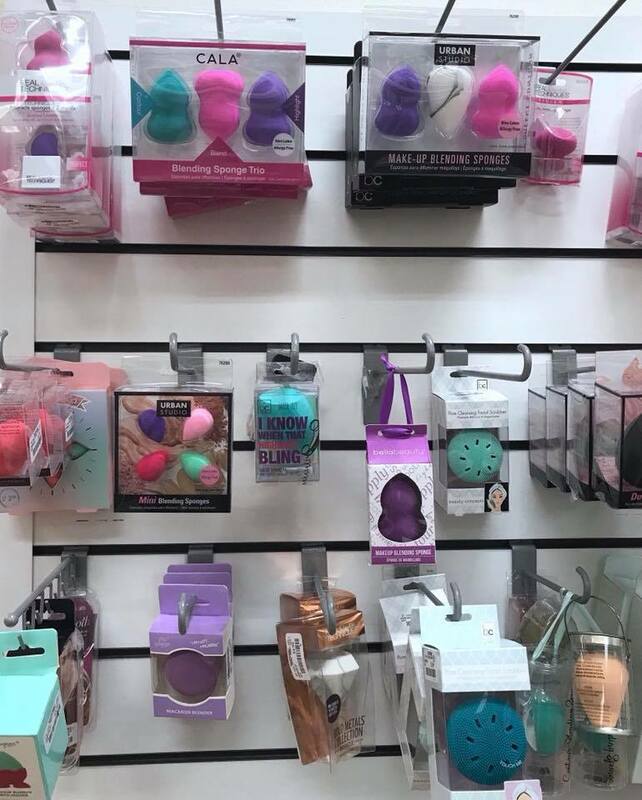 They have every size and shape of makeup blending sponges for a 1/3 of the cost. You can replace your makeup brushes without breaking the bank. I love sunglasses. But they often end up lost, scratched or having fallen out of my bag onto the streets of NYC. So, I shop for multiple pairs at Marshalls and never feel guilty because I know I can find name brands for way less than other retailers. Plus, who doesn't love options when it comes to sunnies. Say goodbye to those over priced stationary stores. 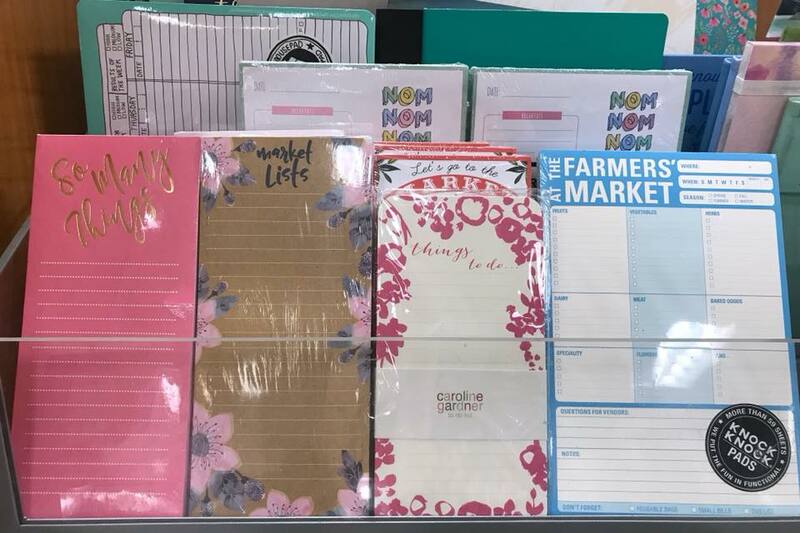 Marshalls has stationary and greeting cards for every occasion. You can stock up on everything from notepads for your desk/office, Birthday cards for friends/family and even a journal for yourself. All of which make great items to gift! I would love to know what items YOU shop for at Marshalls?! Comment below with your favorite finds! Or you can also TAG me in your #MarshallsFinds on Instagram. Hey y'all! Can you believe that Thanksgiving is NEXT week?! I feel like once November begins, the rest of the year goes by so fast and ends up being a blur. Fall is my absolute FAVORITE time of year. I mean what's not to LOVE?! Sweater weather, scarves & boots, cozy nights at home, changing of the leaves and Pumpkin Spice everything. So, in my attempt to hold on to Fall a little bit longer, I'm sharing my bucket list. 1. Once the weather starts to get cool, I love walking through Central Park to see all the leaves that are changing colors. Walking through The Mall & the Bow Bridge are some of my favorite spots to capture photos. 2. Fall isn't complete without a few pumpkins, right?! I love going to the Union Square Green Market this time of year. They have the best selection of fresh produce as well as pumpkins in all sizes and colors. I'll be stocking up on a few for my Thanksgiving tablescape. 3. I love to bake, especially around the Holidays. I always make Pumpkin Bread each year, but this year I'm planning to bake a few pies for Thanksgiving as well. What are your favorite recipes to make? 4. Nothing says Fall like scented candles lit on a cozy night at home. (insert wine here) I'm loving these candles from Target. Because you know, who doesn't need another reason to shop at Target?! 5. I recently learned of a local restaurant that offers Pasta Making Classes here in New York. And I'm excited to make a night of it with my best friend. I actually gifted him this experience for his Birthday last month. So now we just need to pick a date & go! Wine & Carbs....Yes, Please! 6. The Macy's Thanksgiving Parade is a MUST to experience at least once. But last year I decided to go the night before to see the parade floats being inflated on the Upper Westside. They line the floats up over several city blocks and allow you to walk around getting a sneak peak of all the floats. It was definitely less crowded than the actual parade. And I'm excited to do it again this year! 7. Hosting Friendsgiving! Since I moved to New York, my roommates and I have hosted Thanksgiving for the past 3 years at our apartment. We love opening our home to anyone who doesn't have a place to go or just isn't able to travel home for the holiday. Bring on the pie & booze! Hope everyone has a Happy Thanksgiving filled with all the food & surrounded by your friends & family!